Cross-matching data against member organisations means that when one is attacked every member knows. In fact, consortium members report a 45% drop in fraud rates over screening just their own data. With Experian, you get hundreds of the world’s top data scientists and advanced AI tools. Focusing on new detection methods and greater accuracy means that Consortium Members see better fraud management plus still supporting a great experience for their customers. 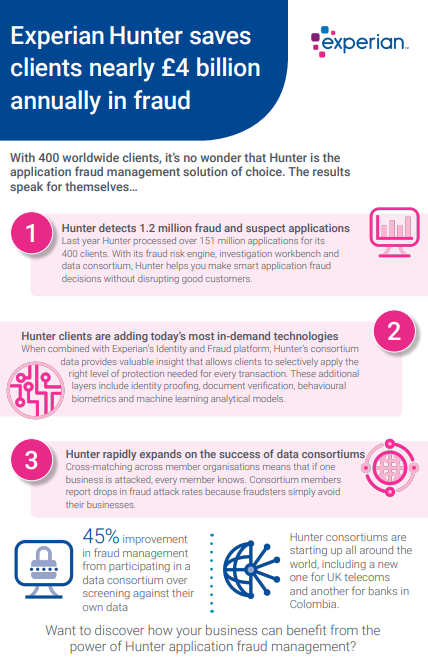 When combined with Experian’s Identity and Fraud platform, CrossCore, Hunter’s consortium data provides valuable insight that allows clients to selectively apply the right level of protection needed for every transaction. These additional layers include identity proofing, document verification, behavioral biometrics and machine learning analytical models. Learn more in our Hunter infographic.